Is there no end to R2D2 paraphernalia? This probably marks the 100th time R2D2 has been transformed into something gadgety – I lost count after the projecting alarm clock, mini fridge, USB hub and webcam. 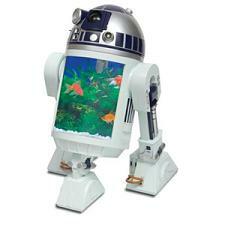 While R2D2 transformations usually fare well in my books, this robotic aquarium falls into the tacky and tasteless category for me. I put it down the exclusion of the blue panels on his arms and lower body. Yes I realise the blue panelling has been replaced with filters, overhead LED tank lights and other necessary fish tank equipment that’ll ensure you don’t wake up to find your fish floating upside down, but somehow it just makes this one look like an impostor. But that’s just my opinion. This water friendly R2 holds 13/4 gallons of H20 – the perfect amount to house your beloved goldfish and a few fishy friends. Keeping strictly within R2D2 tradition, the famous droid’s beeps and bleeps have been incorporated into the design, which get activated with any vocal command you throw its way, accompanied with a rotating bonce. His eye also doubles up as a built-in periscope for a bit of fishy espionage, so you can really see what your fish get up to when they think you’re not looking. The finishing touches the R2D2 Aquarium are discothèque lighting (which can be disabled) and two sides cardboard inserts depicting scenes from the infamous movie.